For those in the know, Edward Douglas and Gavin Goszka of Midnight Syndicate have been tapped to direct and score the horror movie The Dead Matter due out in 2009. To avoid confusion for the readers though, this CD is NOT the soundtrack to the film but rather music inspired by the movie. The actual film score won’t be released until the film makes its debut. There ARE however, a couple of tracks from this release which will make an appearance in the film. 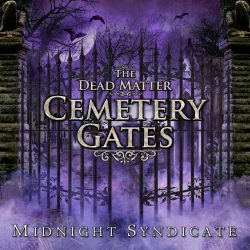 Like other Midnight Syndicate releases, The Dead Matter: Cemetery Gates wraps around tonal structures of the macabre and the wicked to help listeners formulate their own mental film images, their first non-soundtrack release since 2005’s The 13th Hour. Essentially, this release is a mental teaser to extrapolate on the various avenues where the movie itself will take its viewers replete with vampires, ancient Egyptian relics and the living dead. It also pointedly culminates all the various themes from previous releases where we are taken into the familiar orchestration of the artists with a few curves and twists thrown in so that it is not predictable. For long time fans, the tracks Cathedral Ruins, Shadowed Grove, Meeting Of The Acolytes, The Revenants and Called From Beyond are classic Midnight Syndicate instrumental pieces that manage to provide a sense of comfort in their twisted darkened delivery. Nightfall begins the journey into newer territory where the mind is jogged with a feeling of claustrophobic foreboding. It is as though sonically a darkened cloak has been hurled over our eyes and it is up to our imagination to peer through the veil. The Hunt takes on an even more orchestral and sound styling than previously heard by this duo. It is a full on movie score piece to rival some of the biggest names in the soundtrack industry. Across the Chasm layers subtle sound effects under a malevolently played piano while Cemetery Gates is a classical piece that could have been written by Jack The Ripper. Entering The Crypt does exactly what it title suggests. The sonic layers and subtle sound effects are crafted where you can’t help but feel as though you are quietly entering a forbidden grave in some misbegotten graveyard in some hellish nightmare. Alchemist’s Chamber will delight Phantom of the Opera fans as it takes that church pipe organ bombastic madness even further than the Phantom could have imagined. Tear of Osiris is where our duo earned their mettle as they managed to take ancient Egyptian stylization and twist it up to maintain the era while juxtaposing modern haunted elements without overkill. Dark Legacy manages to create a haunting bittersweet and unrequited realm wrapped heavily in horrific detail thus causing us to be alarmed and saddened simultaneously. The bonus material are modern goth rock songs which were written specifically for the film and features maestro Gavin Goszka on vocals. In particular, Not Your Saviour is destined to be a goth/industrial club hit on top of being a major delight for the film viewers. Hopefully these tracks will be sent to club DJ’s across the globe on a special DJ release because they are not to be missed. There is no denying that Midnight Syndicate continue to lead the pack for music destined for haunted attractions, role playing games, film and television. Above all else, they remain an annual favorite of Halloween fans the world over as they have made Halloween music a legitimate genre as opposed to those cheesy sound tracks of days gone by that hardly spook much less delight anyone over the age of 5. It is only a natural transition that this talented twosome should venture from music for the mind and slide comfortably into directing and scoring horror films for the masses. Until the film is released in 2009, we can at least enjoy the forthcoming Halloween season with this great addition to haunt our humble abodes. The Dead Matter: Cemetery Gates is the ultimate horror movie soundtrack. It is symphonic, classic, dark, and ambient, offering a layered sound which is creepy and edgy but not clichéd. I have always enjoyed various Midnight Syndicate releases, but I consider this to be their very best, thus far anyway! This is their first new original release since 13th Hour and it offers a further development of their style, the symphonic and classical texture is polished and refined and the atmosphere created is evocative indeed. The combination of a range of different forms from classical piano to choral renditions, injections of noise and occasional discordant elements, ethereal voices to rock motifs and occasional bursts of traditional horror fanfare make this an innovative and creative horror score. It is a soundtrack which you will want to listen to again and again, it is great on a dark rainy night.